Not content to stop at creating some of the world’s best synthesizer keyboards, the big brains at Moog Music have built an iPad app. The Animoog takes the familiar, spaced-out sound profile Moog is famous for and warps it, using the iPad’s multi-touch interface and some very cool animated visualizations to create a unique instrument. It’s simple enough for anyone to play, but also deep enough to encourage extended experimentation. 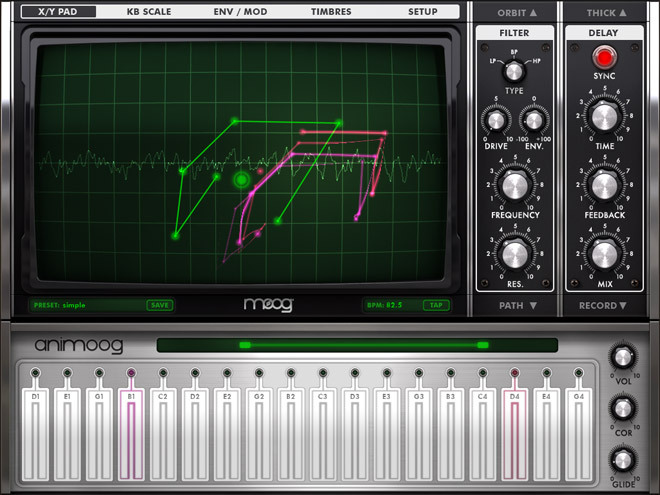 On top of that accomplishment, the Animoog is just about the trippiest sound-thing available for the iPad. The app debuts in the App Store this week for an introductory price of $1. After a short while, it will go up to $30. 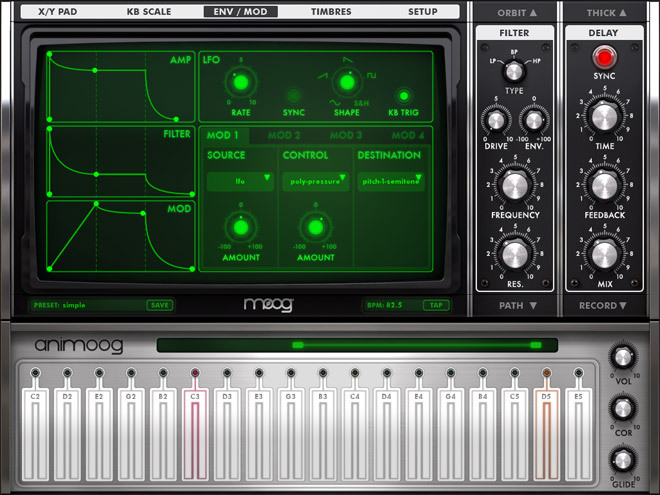 If you’re at all interested in making music on your iPad, you should download this and start playing with it. Ask a musician who’s into vintage synthesizers and they’ll tell you: there’s something about a Moog synth’s analog design that’s difficult to replicate. The musical instruments company, founded by electronics pioneer Bob Moog in the 1950s, makes keyboards that sell for thousands of dollars and are used in studios and on stages by the biggest names in rock and pop. Radiohead, Rush, Air, Stevie Wonder — they’re all Moog devotees. The Animoog not only treads upon the same sonic territory as other Moog creations — if you’ve played a Moog, the interface will feel familiar — but it also takes the aesthetic into totally new directions. The app’s main screen is dominated by a big X-Y pad. It looks very ’70s-analog-esque, sort of like an oscilloscope. Under that is a keyboard. As you key the notes (it’s polyphonic, so you can play more than one note at a time), small, multicolored sprites begin orbiting a node on the X-Y grid. When you drag this node around the grid, the sound modulates. Adding other nodes changes the path of the blippy sprites — they begin to flit around the various nodes, hopping from orbit to orbit like electrons swooshing around the nuclei inside a molecule. The controls on the right are classic Moog. They dictate the speed and intensity of the filter modulations, and there are delay, detune, overdrive and bitcrusher effects. There’s also a bank of preset configurations. If you stumble on something of your own creation that you really like (which happens often), you can save it as a new preset. You can adjust the keyboard, too — adjust its range, make it glide between notes like a theremin, or change the scale modes to play microtones or middle-eastern-sounding things. This isn’t Moog’s first sound app — there’s also the $8 Filtatron, a miniature oscillator and sample-tweaker — but it is the company’s first attempt at building an entirely iPad-based instrument. Lance says it was important to his team that they create something equally capable of being both static, one-dimensional and very musical, as well as multi-dimensional and really wild. Here, they’ve succeeded — setting the orbits to a very slow pulse around a single node creates very pure, bell-like tones that have a dreamy quality. Add complexities to the orbit, twist a few knobs, and you’re headed straight towards Ursa Major at full warp speed. There are dozens of presets to play with, from percussive sounds to soothing string sounds to ominous drones. I tried dialing up some of my own creations and spent a few hours plucking out pleasant, meditative melodies. But I spent an equal amount of time serving up some deliciously flavorful facemelts with extra hot sauce. All this space cadet talk — orbits, travel, cosmic vibrations — is a conscious part of the design, Lance says. “The inspiration came from working with the vast soundscapes of modular synths, where the only limitation is how many arms you have to play the keys, move the knobs and patch cables,” he says. Stretching those limits required building a new language. WIRED A varied instrument capable of both subtle and wild sounds. Excellent sound quality. Plenty of presets to explore. Hours of fun, even if you’re not very musical. This is what the iPad was made for. On sale for $1 — which is a steal, people — for a limited time. TIRED Advanced features are quite complex, and you’ll need to RTFM. Keys are tiny — you can make them bigger, but that reduces the range of notes. And you thought it was tough to wrestle the iPad away from the kids before.